Many irrigation pumps sit out in the rain and the elements. Although the pump head may not rust, the expensive part – the pump motor – will rust. The PumpHaus is designed to protect the motor, yet give it air circulation for cooling purposes. It has a light weight of 6.8 lbs and it is easy to install. 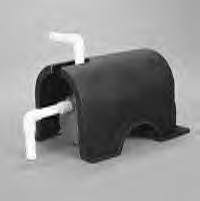 The PumpHaus Pump Cover allows for circulation, it has a cut-out template for discharge line and the feet can be secure to a base.